I’m excited to share with you a very special donation that we recently made to Western Pacific Railroad Museum in Portola, California. 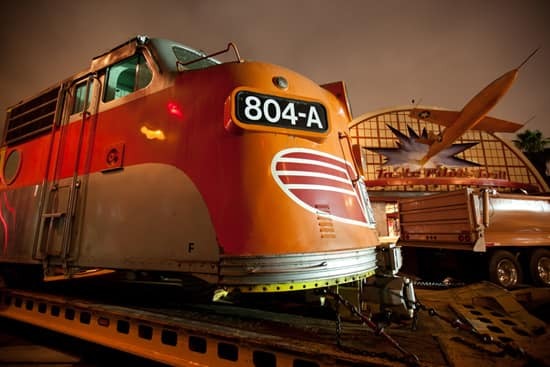 As part of the expansion of Disney California Adventure park, the main entrance is changing and the cab of the California Zephyr train that most recently served as the location for Bur-r-Bank Ice Cream and Baker’s Field Bakery has been donated to the museum. 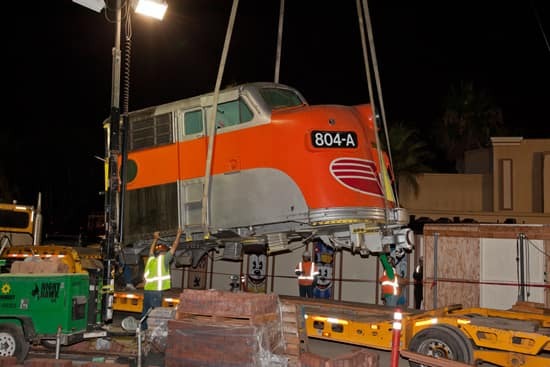 The train and related artifacts arrived at their new home August 6 and will become part of the museum’s Zephyr Project collection. Plans for a gallery dedicated to sharing the legacy of the California Zephyr are underway. Visitors to the museum will learn about the history of the famous 1950s passenger train through the donated artifacts, while the recreated locomotive will offer the chance to experience what it was like for engineers to guide the stainless steel Zephyr trains through California’s Feather River canyon. The cab once operated as a real locomotive. It is an authentic rendition of the Western Pacific Railroad – one of the three railroads that operated the California Zephyr between Chicago and San Francisco from 1949 to 1970. It wears the same number as the last locomotive to lead a westbound California Zephyr into Oakland, Calif. on March 20, 1970. The California Zephyr is one of the most celebrated “name trains” of the 1950s and 60s. Check out the video below to watch as the Zephyr begins to make its way to its new home. Good on you, Disney! This is the best possible new home for this amazing piece. I was thinking about the cat as well! My family was their shortly after that cat, along with 3 or 4 siblings, were born there. We first saw them in 2004. Then in 2008. But in 2010 and 2011 we only saw the one cat still living under the train. Has the shelter been moved? Wow, That was quite the move. It is very impressive that Disney has been able to keep some of these artifacts around the parks for so long. On behalf of the membership of the Feather River Rail Society, operators of the Western Pacific Railroad Museum, we would like to thank Disney for their gracious donation of their California Zephyr, and for their generous hospitality while our crew worked in the park to save the DCA CZ. We really enjoyed ourselves and are honored to be presented with the unique opportunity to preserve a piece of Western Pacific history and Disney history both. Thanks Mickey, we’ll do it proud! My son LOVED the Zephyr and more importantly, buying the ice cream sold inside of it. Sad it’s gone but happy it has found a new home. I’m really going to miss the Zephyr. I loved walking by it and I especially loved getting ice cream there. I hope that the Ice Cream place will open in some other location. 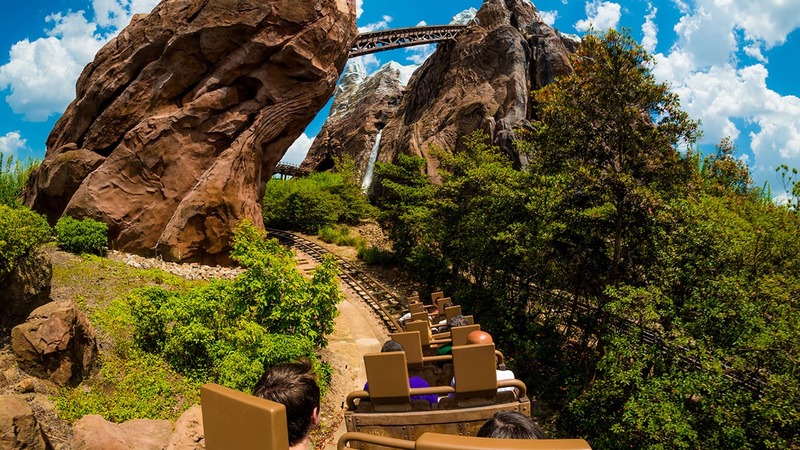 I’m sure the changes will be wonderful, but it’ll be hard not to see some of the things we’ve been enjoying since California Adventure opened. They will be missed! I loved the old train and the ambiance it created. The contrast between the era of the Locomotive and the Jet theme @ the Test Pilot”s Grill and Soaring Over California and the whole Condor Flats area was very cool! Can’t wait to see what you will come up with in it’s place. I think I saw that there would be a Street car/electrified train in the Plaza area, didn’t I? So sad to see the Zephyr go. Our family would stop there for coffee and snacks just about every visit. I am thrilled that it went to the Western Pacific Railroad Museum in Portola, CA as we visit there every few years in August to enjoy their Railroad Days event. At least I have lots of photos of the Zephyr that I’ve taken at California Adventure and I’m sure we’ll visit it in Nor Cal too. We LOVED the Zephyr and enjoyed looking at all of the Zephyr artifacts, but our very favorite thing was the Malibu Mocha Frappe at the Burr-bank Bakery. We never left DCA without getting one. Please, please tell me that when the refurbishments are done, that you will be putting in a shop that will serve them under a different name! PLEASE!! My family and I would take our picture in front of the California Zephyr every time we came to California Adventure. I am sad that we will not be able to continue that tradition. I too am wondering about the ferel cat. Taste pilots grill is our fav place to eat and the cat is there every time. I’m happy to hear it is being donated, but it was one of our MUST stops for every trip to Californian Adventure. I always took time to just enjoy it and the history it displayed. Sure going to miss it and Burr Bank Ice Cream. So are Bur-r-Bank Ice Cream and Baker’s Field Bakery now closed, or are they in temporary locations? Thanks. Baker’s Field Bakery, Burr Bank Ice Cream and Engine Ears Toys closed on August 1 to allow the continued development of Buena Vista Street at Disney California Adventure park. Paradise Pier Ice Cream Co. is a great place to satisfy your sweet tooth. I’m really going to miss the California Zephyr. Last time we were in the park I made sure to take plenty of pictures of it. I think that it’s wonderful that it’s being donated to a museum where it can continue to be enjoyed by others. I’ll miss the Zepher. I took my picture in front of it every time I visited the park. I was wondering about that feral cat too! I am so glad to see this; that was the one thing in the area that I am really going to miss. I hope the feral cat that lived between that area and Taste Pilot’s Grill is coping with all the new construction right there! It was very cool to see whenever I went to the park. Knowing that the California Zephyr will still be around for future generations is great. This was my favorite place to sit and watch guest go about the park. Having worked in the “caboose” portion of the train this is a sigh of relief. Its wonderful that California Zephyr will be donated. Its great that these things don’t go to waste. I’m glad I got ice cream there last time I was at the resort! I don’t know how many Guests actually realized that it was an authentic train cab, or took the time to look at and appreciate all the California Zephyr artifacts that were displayed inside the ice cream shop. WDI did a great job assembling the collection and putting it on display for the past 10 years. It represented yet another layer of special detail the Imagineers put into their work whether it is noticed by the average park Guests or not. I will miss having the California Zephyr and its associated artifacts at Disney California Adventure, but I’m so glad it is all going to a good home.